A boy tries to steer a safe path through the projects in Harlem in the wake of his brother's death in this outstanding debut novel that's been described as a "fast and furious read in which we meet some amazing people, people that stay with us" by Newbery Honor and National Book Award-winning author Jacqueline Woodson. It's Christmas Eve in Harlem, but 12-year-old Lolly Rachpaul and his mom aren't celebrating. They're still reeling from his older brother's death in a gang-related shooting just a few months earlier. Then Lolly's mother's girlfriend brings him a gift that will change everything: two enormous bags filled with Legos. Lolly's always loved Legos, and he prides himself on following the kit instructions exactly. Now, faced with a pile of building blocks and no instructions, Lolly must find his own way forward. His path isn't clear - and the pressure to join a "crew", as his brother did, is always there. When Lolly and his friend are beaten up and robbed, joining a crew almost seems like the safe choice. But building a fantastical Lego city at the community center provides Lolly with an escape - and an unexpected bridge back to the world. 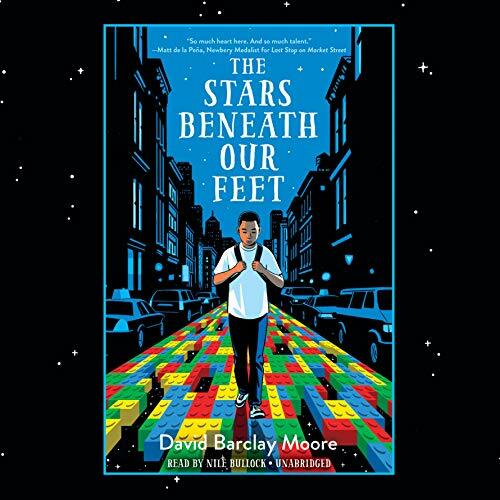 David Barclay Moore paints a powerful portrait of a boy teetering on the edge - of adolescence, of grief, of violence - and shows how Lolly's inventive spirit helps him build a life with firm foundations and open doors. My 7th graders enjoyed it! I used this book with my 7th grade class. Our discussions were lively and personal.